Ludicrous song patterns for UltraStar. Karaoke along with William Shatner! Sing the theme from Zelda with retarded lyrics! Recite Shakespeare along with Laurence Olivier! Re: Techno Kitten Adventure, that's actually pretty inspiring. Mainly the idea of the player trying to perform some delicate act while flashing imagery attempts to make the game as unplayable as possible. Hey, we're onto something! I feel like doing something fairly special/celebratory again this year. Last year it was a parody of Star Wars: Holiday Special from me, and was only vaguely related to Christmas. It also really plagiarized qrleon's trainwrecking style of being a huge ball of surrealism. Then again, not like that's a bad thing, because we're friends here, right? Anyway, expect something a little... _more_ relevant to the holidays this year. Finally, a KoTM on a holiday! Why I've been so busy the last MILLION Saturdays is a sad mystery, but yeah, whatever, Christmas holidays mean I can ignore any responsibilities I have and make something awesome. Or awesomeish at least. Ish. I'll make something anyway. I have been up until midnight every night this week and I've been working on a game for Ludum Dare since lunchtime and I am CRASHING HARD. I already feel about as wrecked as I usually do by the end of KotM and it doesn't start for another two hours! I'm going to have to sit this one out. 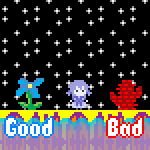 CONSOLATION PRIZE: I've almost finished a little game I've been meaning to make for about a year now (IT ACTUALLY WORKS! ), and tomorrow I'll be adding a ton of radical features. I started a few hours late, but had an idea that I wanted to try. There's nought Christmasy about it.